This video series goes inside the classrooms of educators who use technology tools in their lessons every day. Learn from their challenges, celebrate their successes, and share their resources in every episode. 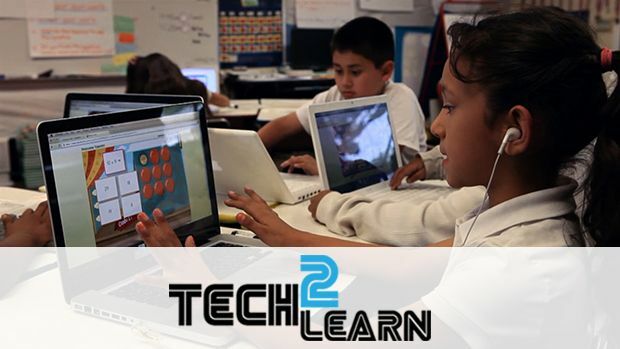 The Tech2Learn series is a co-production with the Teaching Channel. Educator Peter McIntosh helps his students to take ownership of their learning by using interactive subject-mastery tools like Khan Academy. Check out these resource links from Peter McIntosh. Get a better understanding of the definition and the promise of blended learning from this playlist of nine videos and additional resources gathered by VideoAmy. For a comprehensive list of additional resources, you might also want to check out Edutopia’s big list of blended-learning resources. Small, Jr. offers four practical tips for getting comfortable with blended learning: don't assume every kid is a tech wiz, be wary of online textbooks, use PowerPoint sparingly, and encourage student-to-student communication. Stock, a K-12 digital learning expert, explains how blended learning is a construct rather than a model, and details the thinking that led her group to link personalized instruction with student-driven learning. Short on technology? Learn how one educator has found a way to put a single iPad to use so the whole class benefits. Explore Edutopia’s content related to flipped learning, a popular model of blended learning. One good place to start: flipped-learning pioneers Jonathan Bergmann and Aaron Sams walk you through the steps you need to take to make blended learning a reality in their Flipped-Learning Toolkit series. Educator Kate Summers engages her students by asking them to "teach back" chemistry concepts to their peers via online demonstrations created with tech tools like Google Docs, Keynote, and PowerPoint. Check out these resource links from Kate Summers. An under-utilized high school library becomes a constant learning organization and a place of cloud literacy where students present to each other and collaborate via their avatars inside 3-D virtual classrooms. Cooper, a fourth grade teacher with a creative approach to literature study, gets his students into the authors' heads by having them imagine an interview and then construct it collaboratively via app smashing. James, a teacher researcher focused on effective learning and teaching, suggests four collaborative-presentation tool technologies for engaging students with course material in and out of class: myBrainshark, PosterMyWall, Screencast-o-matic and Padlet. Holland of EdTech Teacher looks at the SAMR Model as she walks us through ways to redefine learning through screencasting apps that allow students to combine audio, images, drawing, and text to present, tell stories, and explain thought processes. For more on screencasting, also read "Common Core in Action: Screencasting in the Fourth Grade Math Classroom," by Monica Burns. Miller describes how Ignite, a clock-driven presentation method, offers students an exciting challenge. Starting with four hand-me-down cameras and four donated computers, high school teacher Jim Sill and his students built a successful media production business in Central California. Check out these resource links from Jim Sill. DeGennaro, director and founder of Unlocking Silent Histories, describes the experience of introducing indigenous youth in Guatemala to the art of documentary filmmaking and watching them find their voices. In this community post, Callahan shares 7 tips for teachers on how to get started with making movies in the classroom. Explore tips from other community members in the comments. Peck walks us through tools that can turn students into videographers. Though making a movie may have become easier, making a good one is still hard to do. Using tech tools and games acquired through grants and his own resourcefulness, second-grade teacher Robert Pronovost tailors math instruction to match students' individual learning styles. Check out these resource links from Robert Pronovost. VideoAmy has collected a wealth of resources for teachers looking into classroom fundraising campaigns to help fund technology or other classroom projects. Burns, a longtime fan of QR codes as classroom tools, is now applying them as a way of meeting Common Core expectations to differentiate instruction. Another post from Burns, "Support English-Language Learners With Scannable Technology," is also worth reading. Johnson offers up teaching and technology tools to differentiate classroom learning. Fifth-grade teacher Nicole Dalesio keeps her class motivated to learn by encouraging them to create multimedia presentations and projects using technology tools on the web. Check out these resource links from Nicole Dalesio. For students to embrace the skills needed in a changing technology landscape, teachers must coordinate knowledge, instructional practices, and technologies to positively influence academic achievement. A learning environment is a delicate balance of mutable elements, requiring a nurturing teacher and ongoing evaluation of information handling, content creation, and results. Three digital learning tools, much like an empty cardboard box full of open-ended possibilities, offer young minds the free play of imagination. Davis shares a wealth of apps and platforms that can facilitate teaching and maximize learning within a BYOD classroom and school environment. She counts 51, and these are just her favorites! For more recommendations about apps, check out Edutopia’s Apps page. The 2011 International Society for Technology in Education Outstanding Young Educator shares his thoughts on simple ways of integrating technology. High school computer science teacher Ben Chun's students gain programming literacy and collaboration skills as they work in teams to build video games for elementary school students. Check out these resource links from Ben Chun. Check out Edutopia's collection of articles, videos, and resources on using video games, simulations, and gaming concepts in the classroom. Another great resource is Edutopia’s video series, "Made With Play: Game-Based Learning Resources." Miller explains what a game jam is and how you can use it to teach and assess 21st-century skills, focus on deeper learning, and present content. Proto, middle school English teacher and former technology instructor, talks about how Gamestar Mechanic can serve as a cool student engagement tool. Davis, a computer science teacher and IT integrator, celebrates Computer Science Education Week with an extensive list of year-round resources for teaching students how to code. Digital learning specialist Adam provides a quick overview of seven apps that are appropriate for teaching younger children one of the most critical 21st-century skills: coding. For more resources and suggestions on teaching programming skills, be sure to check out Edutopia’s Coding in the Classroom page.